Inspired by Darwin’s ‘endless forms’ and my favorite pastime, people watching, my research focuses on understanding the evolution of human anatomical variation. I consider myself both an anthropologist and a biologist; both disciplines inform and mould my research. As a foot and ankle evolution specialist, I utilize large datasets to more fully understand the scope of human foot and ankle anatomical variation. I derive these data from skeletons, in vivo medical images such as x-rays, and from cadavers. Then I attempt to figure out how our ancient ancestors’ feet and ankles functioned given what we know about modern humans. I am a member of the Rising Star team. Our work on Homo naledi was published in the open access journal eLife. Here are the species diagnosis paper and the site formation paper. We’ve also published a paper on the foot and ankle of Homo naledi, and continue to develop our understanding of these fascinating ancient hominins. The gait team presented our preliminary thoughts on how Homo naledi walked at the 2016 AAPA Meeting in Atlanta: Homo naledi strides again PDF. At the 2017 AAPA Meeting in New Orleans, we presented our analysis of Homo naledi‘s pedal pathologies (PDF). I am also a member of the international team that described the oldest known hominin cancer, SK 7923, a left fifth metatarsal from Swartkrans, South Africa, dated to about 1.7Ma. This find definitively demonstrates that cancer is not a disease of modern times (or even modern humans!). Here’s a piece on our work from the New York Times. Working with my colleague Jerry DeSilva at Dartmouth College, we found that the famous australopithecine Lucy probably had flat feet. 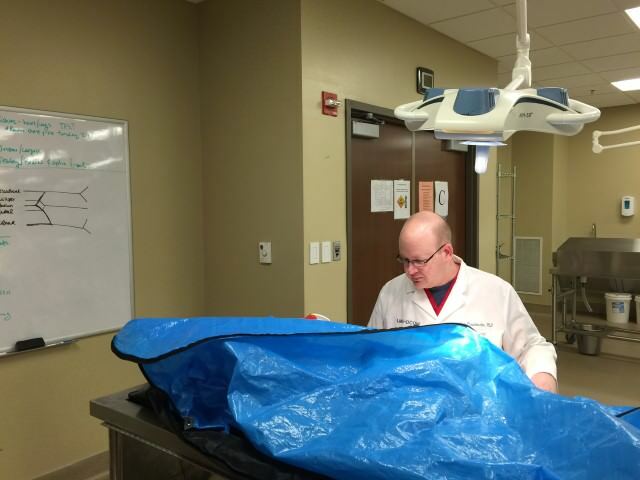 As a practicing anatomist, I have the privilege of overseeing hundreds of students as they dissect scores of cadavers every year. There is much work to do in developing our understanding of how specific soft tissue anatomical structures vary and evolve. Early scientific anatomists often documented the variations they observed. But their work predated dissemination of Darwin’s theory, and they were often unable to make sense of these variations and place them in a broader context. Today, anatomists can use modern evolutionary theory to interpret anatomical variation and hypothesize about evolutionary histories – even though these structures leave no traces in the fossil record. Working with students, we hypothesize that the palmaris longus muscle is undergoing non-adaptive evolution in humans, chimpanzees, and gorillas. Also working with students and colleague John Gassler, we hypothesize that Gantzer’s muscle, an accessory flexor pollicis longus, is an evolutionarily recent and adaptive structure not yet at fixation in humans. I am always interested in collaborating with colleagues at other institutions. Please feel free to email me: zachary dot throckmorton at lmunet dot edu. My first publication was in the open access journal PLoS ONE. I am committed to publishing in open access outlets whenever possible. Having been at small, medium, and large universities, and having collaborated with other scientists around the globe, I believe that as much science as possible should be available freely via the internet to as many people as are interested! Conducting anatomical variation research in LMU-DCOM’s donated body laboratory.